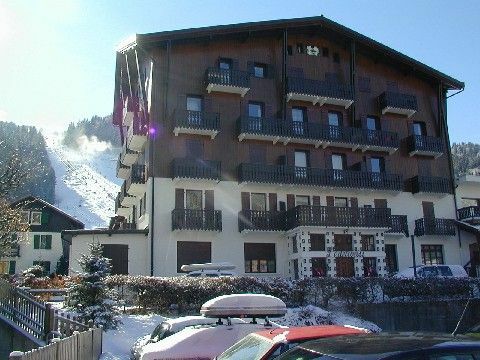 Apartment 4 people very central within 150 M from the slopes. Pretty one bedroom flat of approx. 30 m ² located on 1st floor of a residence with elevator. Exceptionally located in the center of the resort close to the slopes, ski schools and all amenities. Apartment consisting of an entrance with cupboard, a bathroom with toilet, a living room / kitchenette with a sofa bed 2 pers, a bedroom with 2 single beds and a large terrace facing south and south- West. The apartment has a common outdoor parking with reserved access, a ski locker and bike storage in the basement. The apartment is small but comfortable with just about everything that you might need. Two or three minutes walk from Pleney lift and just over five minutes from Super Morzine (in ski boots). Bedroom with two single beds is just big enough and has plenty of hanging and drawer space. Lots more storage in the lounge and entrance lobby, plus a large balcony facing towards Pleney. Ski locker in the basement is only big enough for two sets of kit - we managed a board and a pair of skis - but there is also a locking room where bikes can be stored. You can hear a little bit of noise from adjoining apartments, doors shutting and so on. There can also be a bit of noise from people leaving bars late at night, so you might want ear plugs if you're a very light sleeper. Finally, the staff at Lacoutete Immobilier were very helpful during the booking process, aven ensuring we had ski passes waiting for us when we arrived. They also let us leave our bags in their office as we arrived early from the airport. Thank you for your kind and helpful review. It was our pleasure to welcome you in Morzine and make your stay as easy and comfortable as possible. We are very happy to hear you had a good time in our nice resort. Kind regards. My husband and I rented this apartment for one week in February. It is in a brilliant location...one minute from the Pleney lift with a view of the slopes from the nice large balcony. Very close to ski shops, bars, restaurants, just off the main street so quiet at night. The apartment is small, one bedroom, and is very warm and cosy. However, no sheets or towels are provided, you have to hire them or bring your own and there are no dishwasher tablets or soap. One negative aspect of the apartment is the lack of WiFi. Would definitely stay there again as it is so convenient and comfortable, but I’d like to see the WiFi situation sorted! We'll talk with the owner to install the WIFI and your review will help us. In Les Portes du Soleil one of the best ski area in the world. Morzine will satisfy all the family and people looking for a special atmosphere after ski. Morzine is also very nice at summer. You will enjoy the indoor and outdoor swimmingpools and a lot of others activities.